This week’s review is a limited edition blend that I look out for every year. The Camacho Liberty 2010. I smoked a few of these cigars, but this one in particular was actually sent to me by our good friend Mike at Mikestogies.com. Mike was the man who actually sent over the sticks I did on my first blind review set which you can view here. He’s a great guy, with great reviews. The Good Stuff: Each year Camacho releases a limited release cigar called the Liberty Series.The tradition started back in 2002 and is one of my favorite annual releases. They retail anywhere between $18 and $22 a stick and come in boxes of 10 individually coffin-boxed cigars. If you’d like to read our review of the 2009, you can see Daniel’s take on it here. Again, the scenery may look a bit different. I am doing yet another review at my favorite local shop, Tobacco Rd. 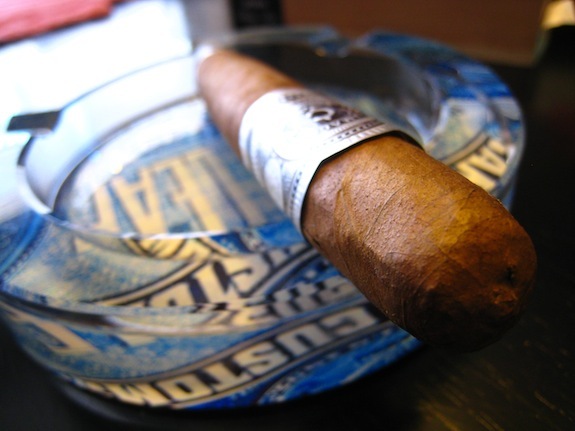 Prelight: The Camacho Liberty 2010 holds true to all the past Liberty series in terms of presentation. The Liberty starts out encased in a dark blue, shiny, painted coffin box. Each box has a sticker with each cigar’s unique number. This one happens to be 775 /40,000. Once the seal on the box is broken I was showcased with a nice cedar scent and a tissue wrapped cigar placed carefully inside the box. Once then tissue is removed you are presented with the standard, flashy, black and silver Camacho band that you would expect. One interesting thing about this band is out of all the 2010 Liberties that I smoked, this was the only one with a black band. All the rest of them had a dark blue similar to the color of the paint on the box. The band is very similar in design from the previous years. The Liberty 2010 also comes fitted with a nice little foot band that simply states “Liberty Series” in silver on dark blue ink. The wrapper on the Liberty is a very light, very consistent, milky brown. The smaller foot leads up to a much wider body before tapering off to a smaller, rounded cap that matches the size of the Liberty’s foot. 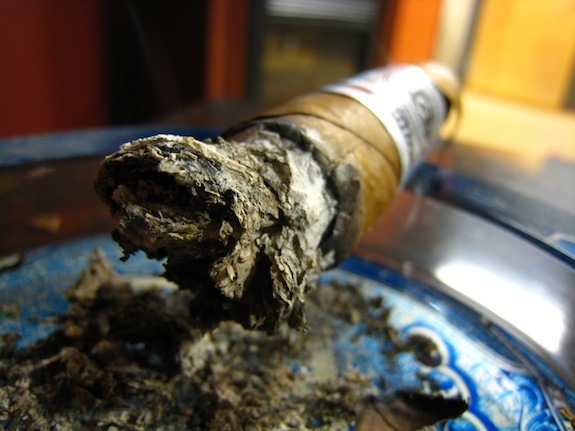 For the most part the cigar is very firm to the touch with the exception of the foot. 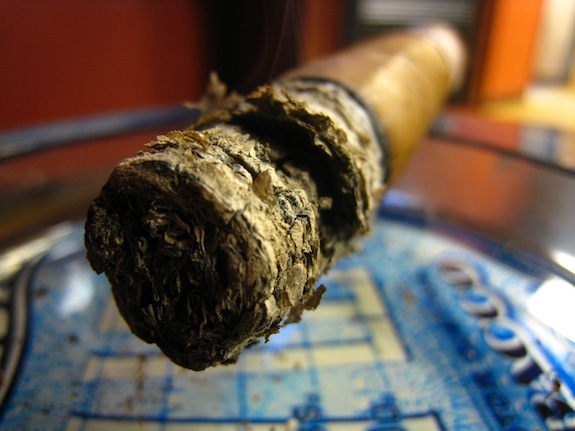 There is a crack at the top of the cigar from the head to about the middle of the band. Mainly just a wrapper crack. It looks as thought it didn’t harm the binder. Normally I wouldn’t review a cigar that already has a crack in it, but this is my third Liberty 2010 from three totally different boxes that have similar cracks. Not to mention I had a few similar issues with the 2009’s I smoked last year. This just must be a delicate wrapper. The wrapper has this immense scent of straight up cedar. It seriously smells like the inside of a brand new humidor. which happens to be of my favorite scents in the world. Some how the foot has an ever stronger cedar scent with just a little whiff of spice. The Liberty cut very clean with my double bladed cutter. Lucky enough, the crack didn’t increase much in size. The cold draw kicks out this wonderful milky, cedar flavor and leaves behind just a tiny bit of spice. First Smoke: The Liberty 2010 starts off slightly different than I expected. 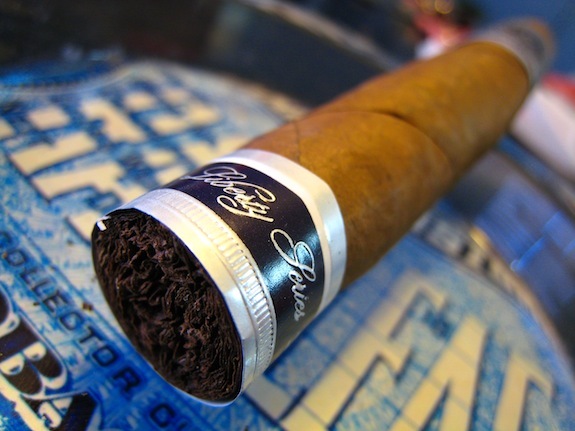 Instead of being smacked in the face with soft cedar, the cigar starts off bold, with some earthy, leather notes. Not long after the cigar turns into this just massive cedar bomb, holy crap. This is the reason why I love these Liberties. Outside of the cedar there is a slight spice sneaking into the mix. All around this cigar is starting off very smooth and flavorful. The draw is easy, and plentiful, but the main story is the stationary smoke. The Liberty 2010 gives off a ton of cedar scented stationary smoke that even overpowers the other three cigars that are going in the room at the time. The burnline is slightly wavy, but I always have that problem with this size. They almost always fix themselves. The ash is a very light grey with some slight flakes, but overall tightly compacted. The ash held on for a little over an inch before giving way. 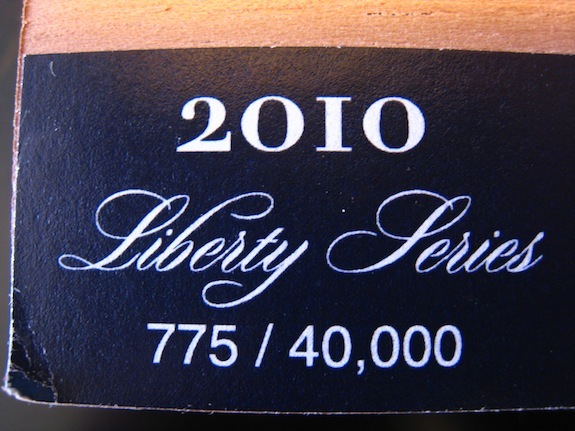 Halfway There: One major difference with this year’s 2010 Liberty is a big one for me. The cigar burns so much slower than the previous year. The 2009 was soooo good, but at the price point I was always hesitant to spend the money to buy a cigar that would burn so quickly. The cedar is still rocking very hard into this second third. The spice is still there as well with notes of leather and some really creamy chocolate. The retrohale in this cigar is absolutely amazing. After a few retrohales I swear my nasal passage made me feel as if I have been locked in a humidor for the last 3 days. The body is slowly starting to creep in as well. It’s not full, but it is noticeable. The burnline has completely fixed itself and is holding solid as I expected. The ash is ugly, but the experience is wonderful. 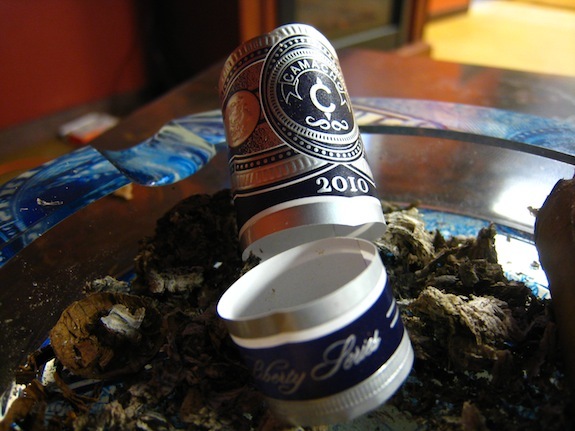 Finish: The cedar has begun to fade a bit into the final third of this Camacho Liberty 2010. The cedar is still the main flavor with the backing flavors of spice, and this really strong leather flavor. The body has really ramped up too, which is totally unexpected. I’m even getting a slight nicotine kick from this one. There was a slight harsh build up into the last inch but nothing too concerning, it was almost expected. All in all the cigar finished very smooth, a bit heavier than I expected, and burned much slower taking about an hour and forty five minutes to finish. Overview: The Camacho Liberty has always been a cigar that I look out for every year. The similar blends are just wonderful. The cost is a little high, but it’s a great cigar, for those special times. The slower burn was great, but it had its own drawback. Towards the end of the experience the cedar starting to get overwhelming and it made me want the tobacco flavors to come in and really take over. 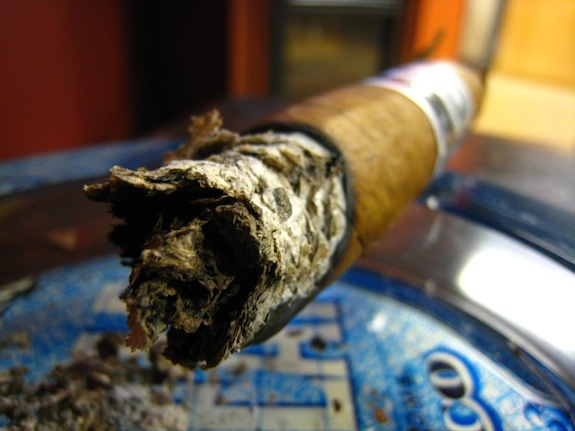 The crack really didn’t make much of a difference, and seldom does in this cigar. All in all, it’s a good cigar, at a decent price. But the Liberty is not something that I would put in my regular rotation due to the price, and availability. I do however love to keep a few of these on hand to satisfy those cedar cravings. Nice review Tony. I had really bad luck with the Liberty 2010. The ash was just out of control (similar to how it looks in your pics above). Couldn’t get the ash up to near one inch before it was falling all over me. Also had trouble keeping it lit — had to relight a bunch of times. I put it as my “most disappointing” cigar of 2010. I agree with ya man. The flavors are there, but the asthetics just aren’t. I still think the 2009 had to be my favorite Libery Series. It’s funny cause Daniel and I were just talking about Padron. And given the price point on the Liberty I really think that seeing the two side by side on a shelf, I’d walk away with a nice little Padron Anniversario. Tony thanks man for the mention and the kind words. I to keep these on hand and have some still from 07 -2010. I am glad u liked it and it seems every year I get cracked ones as well I think itsthe coffin they come in. Keep up the great job you guys do and again much thanks.